There are some people in our community that just stand out; they rise just a little above the crowd but are not arrogant. They are, in fact, some of the greatest in giving back, paying it forward people out there. Steve Levy is one of those people, and I am honored to call him a friend and at times a mentor. 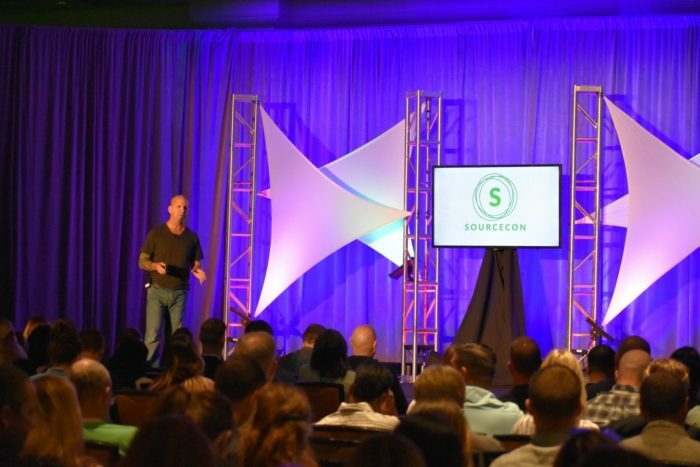 Levy, or as he is known by many, “Uncle Steve,” has given a great deal to the industry and his afternoon keynote at this past SourceCon was no different. We should be better at working with these hiring managers to garner an explains to help you better source more efficiently. There should be no intake meeting. Instead, there should be a strategy session with your manager or recruiter to map out exactly what you need to find. We have to start focusing on not calling managers customers or recruiters. These are members of your team with a common goal; hiring the right people with the least friction for everyone possible. Levy then spoke to a common trait and something I believe many would ask themselves, “Courage is feeling fear yet choosing to act.” Just recently there was an attack on civilians in Las Vegas, and it was a tragedy yet there was hope as the tragedy unfolded. People helped strangers find shelter, a husband gave his life for his wife, and a complete stranger comforted a dying man telling him that she would not let him go knowing full well he was going to die. These people like the firemen that ran towards the towers 9/11 with full gear on because the truck they were on could not get through but they had a job to do. This is courage folks, and it can and should apply to our tribe. Levy has a keen knack for finding quotes and stories that fit into the conversation we have all been having for a very long time, and that is what makes a great speaker in my opinion and, well a great friend that I call a brother. Its understanding that if we do not continue the conversation, we will be forever stuck in the madness we allow ourselves to live in.